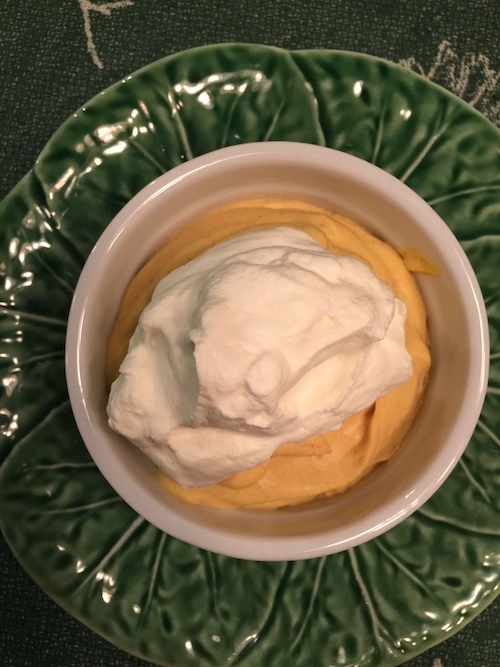 Here’s a quick, easy Thanksgiving desert that will keep you in keto-land and still deliver a rich dessert. Note—be sure to allow enough time for the mousses to chill. I’ve included vegan substitutes for dairy items. Blend cream cheese and pumpkin puree in a stand mixer or food processor until smooth. Add the rest of the ingredients and blend until fluffy. Taste, and adjust flavorings and sweetening, if needed. Pipe into ramekins of other dessert cups. Refrigerate for at least an hour. Garnish, if desired, with a dollop of whipped cream and a cinnamon stick. Note: May be made a day ahead and refrigerated until served. This entry was posted in Desserts & Jams, Low Carb on November 16, 2018 by Blackberry Season.